Welcome to the new home of my cooking blog, Hasty Tasty Meals. Archives from the old site are still available at chefcheri.wordpress.com. Be sure to sign up for my monthly emails at http://eepurl.com/2E3jT for more recipes and writing news. I don’t share or sell mailing lists, so your email address is safe with me. I hope you enjoy my blog posts from my kitchen. Feel free to comment! For years, a recipe for making a healthier pizza crust from cauliflower has made the rounds. Although interested, I couldn’t find the enthusiasm to try making it. Like Tres Leche Cake, it was too labor-intensive to fit my criteria for a Hasty Tasty Meal. Thanks to Green Giant, that’s no longer the case. Cauliflower pizza crust is pricey ($4.99 at my local grocery store), but is worth the investment if you’re craving pizza and can’t sacrifice nutrition. Yes, nutritional pizza is no longer an oxymoron. Remove cauliflower crust from its packaging. Prebake crust directly on the rack for 12-15 minutes. While crust bakes, combine sauce, seasonings (including garlic), and turkey sausage patty in a blender or food processor. Don’t overprocess. Stir in mushrooms. Also, grate cheeses if needed. Carefully remove crust from the oven using a pizza peel or large spatula. Spread the sauce over the crust and sprinkle the chopped onion and pepper. Cover with shredded cheese and return pizza to the oven, again placing it directly on the oven rack. Bake just until browned and bubbly (approximately 6 minutes). Carefully remove the pizza and allow it to cool for 3-5 minutes. Slice into 4 pieces and serve. Serve in 1/4 pizza slices. It’s Thanksgiving month. 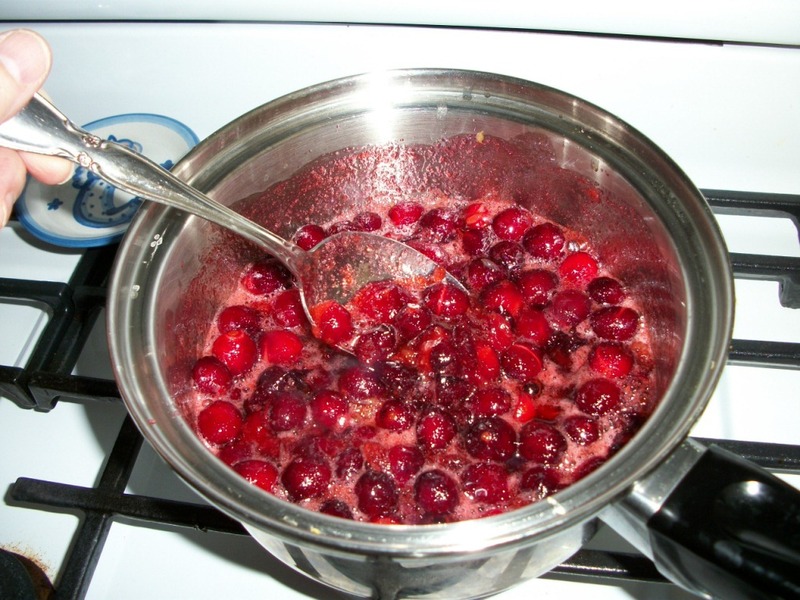 Here by request is a repeat of my cranberry sauce recipe. It’s easy and so much better than canned, so give it a try. Happy Thanksgiving! Serve or store in the refrigerator. 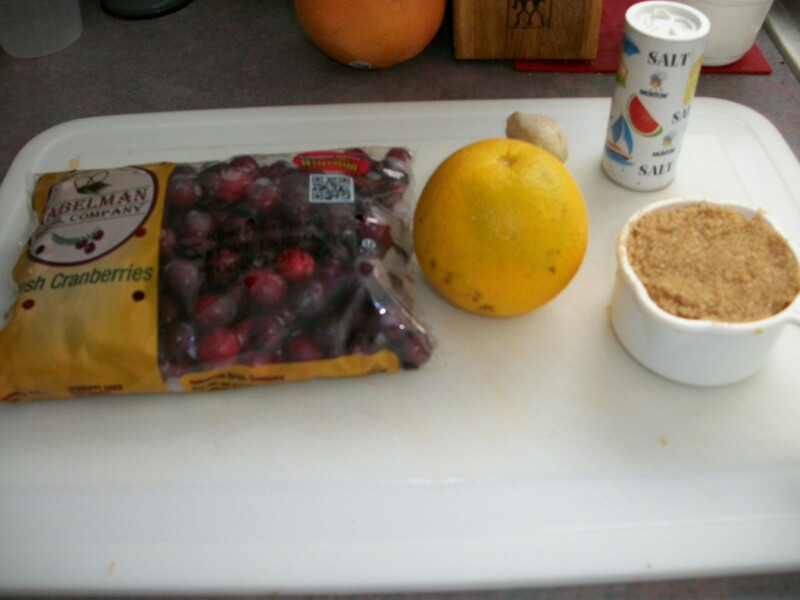 Combine brown sugar and juice of an orange (reserve zest) in a 2-quart sauce pan. Add cranberries. Gently heat over medium-low heat, stirring occasionally, for fifteen minutes or until berries burst. Remove from heat. Stir in zest of orange and grated ginger. Carefully pour sauce into a mold or a serving dish, cover, and refrigerate for a minimum of one hour. Overnight is better. *Processing the sauce is optional. 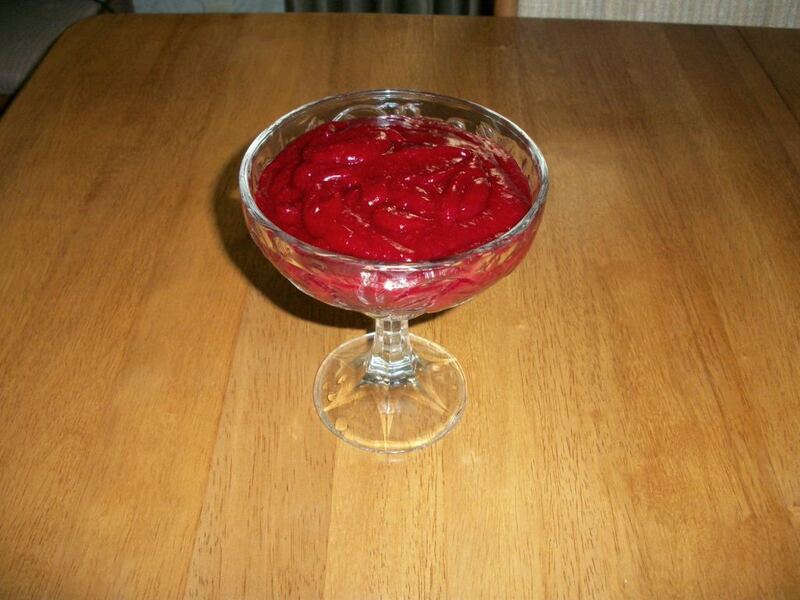 Cranberries taste great either whole sauce or pureed. Variations: add your choice of seasonings in place of the grated ginger, such as cloves, cinnamon, or even jalapeño pepper! I love bagels but not the kind in grocery stores. Our time living in New Jersey spoiled me for fresh, NY style bagels. I’m not returning to the northeast anytime soon, so I’m making my own. I won’t heat my Florida kitchen using the oven, either, so here’s my take on air fryer bagels using a recipe I found in the Weight Watchers’ Facebook group. Combine flour and yogurt and mix well. Allow dough to rest 30 minutes and then knead 4-5 times. Bring 1 quart water to boil in a large saucepan. Separate dough into 4 spheres. Shape bagels by punching the middle of each sphere and spinning the dough until desired shape. Drop each bagel into the boiling water, turning after 2 minutes. After boiling bagels for a total of 4 minutes, remove to drain on paper towels. Sprinkle tops with coarse salt. Place bagels in air fryer and set for 390°-400° (settings vary per air fryer) for 7 minutes. Remove and enjoy with your favorite cream cheese or jam! Do these bagels taste as good as NY bagels? Not even close. However, they’re good enough, and these bagels are only 2 SmartPoints® on the Weight Watchers® program! My husband loves turkey, and I indulge him because I love him and turkey, too. Turkey is an inexpensive protein. It’s not exclusively a holiday meal, either. We have turkey year around. But we live in sunny Florida. Nobody wants a hot kitchen after using an oven for several hours, especially in summer. I researched alternatives (No to the indoor turkey fryer, and no to the electric roaster). I’ve successfully pressure cooked and slow cooked a turkey breast with good results, yet never a full turkey (and I love the dark meat). After watching one too many Sunday morning infomercials for the 10-quart Power Pressure Cooker XL, in which Eric Theiss exuberantly shows off a whole turkey cooked in 40 minutes, I ordered one for a birthday gift for myself. I was skeptical because I want stainless steel pots, not nonstick-coated aluminum. The PPCXL has only the nonstick-coated aluminum inner pot. As far as I know, there is no stainless steel replacement pot that will fit it. I resigned myself to the nonstick pot, though, and tested the cooker as a turkey roaster. Oh my goodness! I am so pleased with the results, and so is my family. Now turkey dinners aren’t limited to cool weather months. There are a few tricks to my pressure cooked turkey, though. First, it must be no larger than 12 pounds. Mine weighed in a tad over 11. Second, use a bit of butter. I thoroughly greased the bottom of the nonstick inner pot with butter. I also put a little butter between the skin and the breast meat on either side of the wishbone. If you like crispy skin (we don’t eat skin), you’ll need to brown it under the broiler for 5-10 minutes before carving. Finally, I let pressure drop completely before opening the cooker and removing the turkey. From prepping the turkey to serving it took a total of 2 hours, still much quicker than oven roasting. As for the nonstick coated pot I detest, it fared well and cleaned up easily in hot soapy water. I baby it with nylon or silicone tools and gentle scrubbing, though. Except for the nonstick coated pot, I’m impressed with the performance of the 10-quart PPCXL. I own an older model PPCXL that’s noisier and a bit more difficult to use, so Tristar has made improvements I like. If you’re in the market for a large multi-cooker, consider the 10 quart Power Pressure Cooker XL. (Check out the video on YouTube for the infomercial) If you want something smaller, stick with Instant Pot or other brands that offer the stainless steel inner pot. Divide butter and use 1 Tbsp. to coat bottom of the pressure cooker’s pot. Pour 2 cups water into the pot. Place the turkey inside the pot, breast side up. Stuff the cavity with the onion, garlic, celery, pepper, and carrot. Gently separate the skin from the breast meat and insert 1½ tsp. butter on either side of the wishbone. Generously sprinkle turkey with salt, pepper, and poultry seasoning. Seal pressure cooker and bring to pressure. On the PPCXL, select Chicken/Meat and adjust time to 45 minutes. When the turkey has cooked for 45 minutes under pressure, remove from heat (or hit Cancel button) and allow pressure to drop completely on its own (approximately 15 minutes). Carefully remove the turkey from the pot using lifters or two sets of tongs. Place on a carving board and cover loosely with foil. Strain the cooking liquid and reserve for making gravy, soup, and/or dressing. Allow turkey to rest another 10-15 minutes before carving. Serve and enjoy! Stuff cavity of turkey with aromatics. Success! But for prettier presentation and crispy skin, place turkey under a broiler for 5 – 10 minutes. Do you know the difference between brown rice and white? White rice is refined. It’s had the brown coating removed. So brown rice is actually rice. White rice is refined rice, like whole wheat flour and refined flour. Because I try to keep my carbs complex, I prefer brown rice to white. It also has more taste. But it takes a lot longer to cook than regular rice. Take 1 cup brown rice and rinse. Cover with 1 1/4 cups water and soak for one hour. Set a timer. Do other stuff. Check Facebook. Whatever. After an hour, add salt or other flavorings, seal the Instant Pot (or other brand multi-cooker you use), and select Rice. (Soaking brown rice also shortens cooking time in a stovetop pressure cooker, too. ) At the end of the cooking time, hit cancel and allow pressure to drop on its own 10 minutes. Release any remaining pressure. Carefully open the pot and fluff rice with a fork. You have 4 servings of perfectly cooked brown rice. This has worked every time for me. If it’s too much trouble to soak ahead of time, just cook the rice for 22 minutes followed by the 10 minute pressure release. But I really like using the special rice cooking setting because it’s convenient. Add more whole grains to your diet as you begin the new year. You’ll be healthier for it! I’ll admit I’m a kitchen geek. 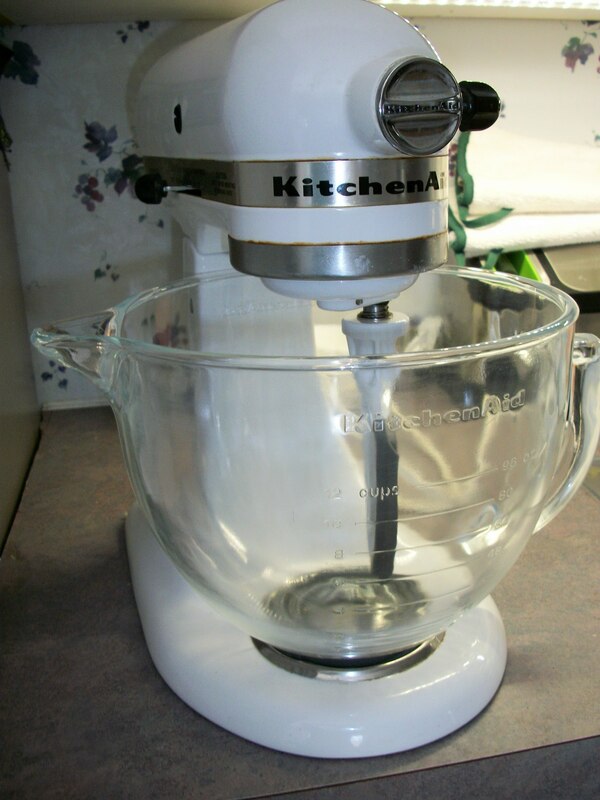 I love my Vitamix, my Kitchen Craft and Americraft Cookware, my Instant Pots, and my KitchenAid stand mixer. I didn’t need a Cuisinart. I just wanted one. So this year I asked Santa for the 14 cup model, rated the best by America’s Test Kitchen for 2017. Christmas came early for me this year. Yippee! 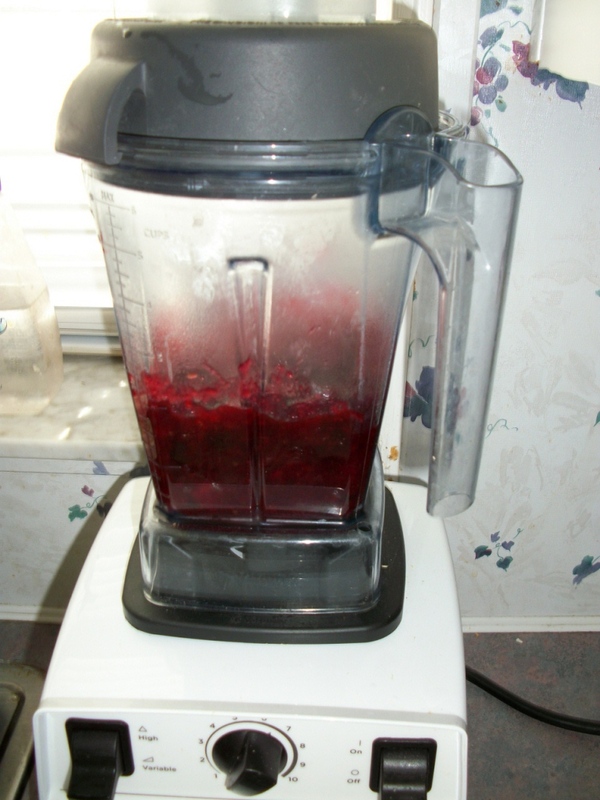 What makes me want a food processor? I’ve had two, neither of which did what my Kitchen Cutter does (and without electricity!). Not abandoning my Kitchen Cutter, either. But there are food processors and then there is the Cuisinart. My new Cuisinart slices tomatoes! I kid you not. It grates cheese, cuts butter into brown sugar or flour, and blends creamy sauces. Here is my lightened version of Scalloped Potatoes using my Cuisinart and a stainless steel cake pan. You can make it without a Cuisinart or cake pan, of course, but my way is fun and easy. Using the slicing blade to the food processor, slice potatoes and onions. Set aside. Switch to the grating blade. Grate mozzarella cheese. Set aside. Switch to the mixing blade. Combine Neufchatel cheese with the chicken broth. Process until creamy smooth. In a square or round baking pan, layer half the potatoes and onions. Add salt and pepper. Sprinkle with half the mozzarella cheese. Repeat with a second layer. Then pour the Neufchatel cheese sauce over all. Remove foil and bake an additional 10 minutes or until potatoes turn slightly golden. Remove pan from oven and allow to cool 10 minutes before serving. Smooth the cream cheese mixture. We don’t eat much red meat, but when we do, I splurge. I buy only meat from grass-fed livestock that has no added hormones or antibiotics. We enjoy pot roast, but a traditional recipe cooks hours. I’m about “hasty” meals, so here’s my version. I promise it’s just as yummy as the slow-cooker version. Using a packet of soup mix saves time with your spices. It’s all there, including salt and pepper. You need only an hour total for this Hasty Tasty Meal. 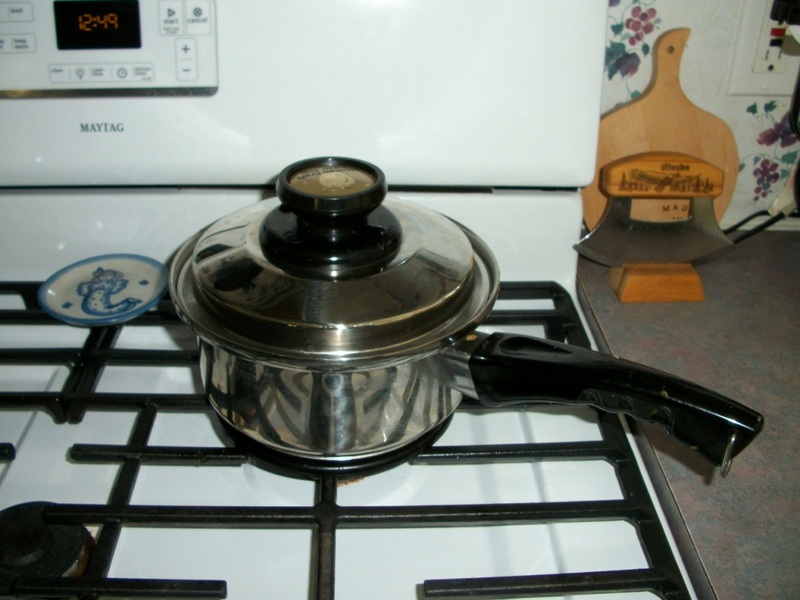 I use a pressure cooker to reduce cooking time. Since so many of you have asked for Instant Pot meals, I used my 6-quart Instant Pot. However, the recipe works in any pressure cooker, electric or stovetop. 2 medium russet potatoes, quartered (or 6 whole baby Yukon golds if you prefer). Peel if you want, but after cooking, the skins slide off easily. Preheat the pot using the sauté setting. When the display reads Hot, spray generously with cooking spray and add onions. Using the dehydrated onion soup mix, dry-rub the meat thoroughly. Slice meat into 1½ to 2 inch pieces. Add meat to the pot to brown. After a couple of minutes, turn off the Instant Pot. Add garlic and tomato paste. Stir. Pour in the broth. Using a wooden spoon, deglaze the pot, incorporating the flavors into the broth. Add sweet peppers if using. Place the potatoes on top the meat. Seal the Instant Pot and program (using either the meat or manual buttons) for 30 minutes. If your model has two pressure settings, select high (which is the default). While meat cooks, prepare the slurry, and slice carrots into 1″ pieces. After 30 minutes, hit Cancel and allow pressure to drop on its own for 10 minutes. Then release remaining pressure and carefully open the pot. Add the carrots, replace seal, and return the Instant Pot to pressure for 0 minutes. Allow pressure to drop on its own completely before opening the pot. Using a large spatula, lift the meat, potatoes, and carrots onto a platter. Tent with foil to keep warm. Using the sauté button (Never cover the pot with the lid while using the sauté function), bring cooking liquid to a boil and whisk in the cornstarch slurry. As soon as the liquid begins to thicken, turn off the pot, remove it (careful! Use your silicone mittens for this) to a heatsafe trivet or folded towel, and gently pour it into a measuring cup or gravy boat to serve. Serve platter with a drizzle of the gravy and a dinner roll. Why use chicken broth instead of beef? Unfortunately, I’ve yet to find a store-bought beef broth that tasted good. There’s an artificial, almost “tinny” taste to it. Yet chicken broth or stock is mild and actually brings out the umami flavor of the meat. If you have neither, use water. It’s only a cup and it’s better to go plain than bad-tasting for your cooking liquid.